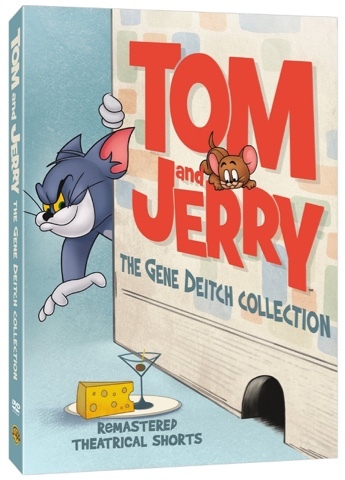 GenreOnline.net: Tom and Jerry: The Gene Deitch Collection DVD Review. Tom and Jerry: The Gene Deitch Collection DVD Review. When it comes to Tom and Jerry, my personal favorites have always been the Hanna Barbera cartoons. For me they were the funniest and the cutest. There were cartoons that were made for Saturday morning network programming in the 1970s, but they never interested me. In between Hanna Barbera era and the 1970s, Metro-Goldwyn-Mayer hired Gene Deitch following his Academy Award winning short Munro to produce a new season of Tom and Jerry cartoons that would premiere theatrically in 1961. Despite not being a connoisseur of Tom and Jerry, Deitch did endeavor to remain true to the character of each and even met with Hanna and Barbera following his acceptance of the job. Seeing the biblical roots of the characters as coming from David and Goliath, but with extreme violence where neither character ever dies, Deitch sought to bring his sensibility with smarter "weapons of mini destruction." The result though proved to be distinctly different from the previous cartoons and would end up being the only season produced outside the United States for U.S. Theaters. Deitch hopes viewers who watch these shorts now will accept them for what they are, which is fair enough. Personally I never liked these cartoons. Particularly the Dickie Moe episode, which is included in this set, has always struck me as being creepy. Yet my preference aside, all 13 episodes have been remastered for clearer picture and sound and are presented in their theatrical release exhibition format on this DVD with English and Spanish Mono Soundtracks and English Subtitles for the Deaf and Hearing Impaired encoded as options along with Spanish Language Subtitles. Two featurettes are also included along with an insert within the DVD keep case containing episode information, disc content documentation and liner notes that include a thoughtful forward by Gene Deitch. Tom and Jerry: The Gene Deitch Collection is available now at retailers on and offline on DVD-Video courtesy of Warner Home Video.